Two teenagers greet each other at Beacon Academy, 1574 Sherman Ave., Friday evening. Beacon students hosted about 30 Syrian refugees for dinner. While President Donald Trump tries to reimplement an indefinite ban on Syrian refugees entering the country, students in Evanston tried to make a statement by inviting them over for dinner. 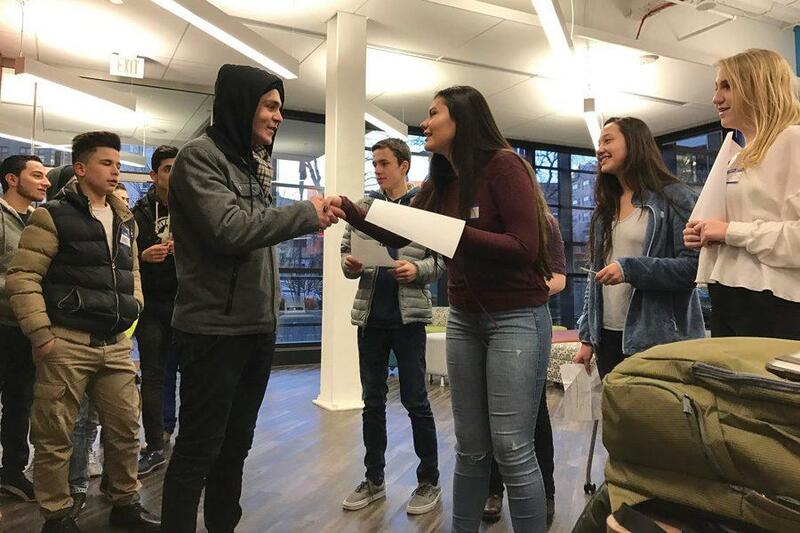 Despite language and cultural barriers, students from the Beacon Academy high school in Evanston found common ground with teenage Syrian refugees through a viral internet phenomenon: tossing a third-full Deer Park water bottle so it lands vertically on a table. “When we make friends, we look for something in common. Even though this is little, it’s a really amazing thing,” said 15-year-old Michaela Abrams, a Beacon student. On Friday night, about 30 Syrian refugees ate dinner with roughly the same number of Beacon Academy students, conversing over pizza, popcorn and pretzels. Abrams — who helped organize the dinner with the Syrian Community Network, a nonprofit that assists in the resettlement of Syrian refugees — said she got the idea for a partnership from a service fair last fall. Last month, Trump signed an executive order that indefinitely banned Syrian refugees and limited immigration from six other countries. A ruling from Washington on Friday halted the order nationwide. A federal appeals judge in San Francisco then rejected Sunday an appeal from the Justice Department requesting to reinstate the travel ban. At a time when many refugees feel unwelcome in the U.S., Abrams said, the dinner presented an opportunity to prove otherwise. Hadia Zarzour, a trauma therapist and vice president of the Syrian Community Network, said Friday’s dinner worked against Trump’s rhetoric on immigrants and helped humanize a refugee crisis primarily portrayed through numbers. There are about 140 Syrian refugee families in Chicago, and six that live in Evanston, she said. The Syrian teenagers paired off with an American counterpart during the event. Using a worksheet, the students had to find someone who: plays basketball, drank coffee today, has been in a play, lives in Evanston and has read every Harry Potter book. Abrams said she connected with a girl from Syria through their shared interest in music and theater, both having worked on a show and played in an orchestra.